Hurricane Matthew struck southwestern Haiti near Les Anglais on October 4, 2016, leaving widespread damage in the impoverished nation. Matthew was a late-season Category 5 hurricane on the Saffir–Simpson scale, having formed in the southeastern Caribbean on September 28. The hurricane weakened to Category 4 before making landfall near Les Anglais on October 4, at which time the National Hurricane Center estimated maximum sustained winds of 240 km/h (150 mph). This made it the strongest storm to hit the nation since Hurricane Cleo in 1964, and the third strongest Haitian landfall on record. Hurricane-force winds – 119 km/h (74 mph) or greater – affected about 1.125 million people in the country. The Haitian government assessed the death toll at 546, although other sources reported more than three times that figure. During Matthew's passage, high winds, heavy rainfall, and deadly tides lashed the Tiburon Peninsula in southwest Haiti. Nationwide, the hurricane nearly or completely destroyed around 200,000 homes, leaving 1.4 million people in need of humanitarian aid. Monetary damage was estimated at US$1.9 billion. Nearly complete crop damage occurred in Grand'Anse and Sud departments, leaving the impoverished population without a source of food. Communication networks and the road system were also compromised. After the hurricane washed away the Petit-Goâve Bridge, southwestern Haiti was temporarily unreachable from the remainder of the country, which slowed the distribution of emergency aid. The ongoing cholera outbreak worsened after the hurricane, killing at least 29 people. With insufficient resources to respond to the hurricane damage, the Haitian government requested assistance from other countries. The United Nations launched an emergency appeal for nearly US$120 million in aid, and countries throughout the world provided money, supplies, and logistical support. Before and after the hurricane's landfall, UN agencies provided food, materials, and a peacekeeping force to residents, which was supplemented by various non-government organizations. Tropical Storm Matthew developed on September 28 from a tropical wave moving through the southern Lesser Antilles. Low wind shear and warm waters favored strengthening, and the storm intensified into a hurricane on September 29. Early on October 1, following a period of rapid deepening, Matthew reached Category 5 on the Saffir–Simpson scale, with peak sustained winds of 270 km/h (165 mph) while north of the Colombia coast. Upwelling of cooler waters subsequently caused Matthew to weaken to a Category 4 hurricane. By October 3, the hurricane was moving northward through the Caribbean around the western periphery of a large ridge, while maintaining Category 4 intensity. On the next day, Matthew re-intensified to attain a minimum central pressure of 934 mbar (27.6 inHg), along with winds of 240 km/h (150 mph) around its well-defined eye. On October 4 at 11:00 UTC, the storm made landfall on the Tiburon Peninsula of southwestern Haiti near Les Anglais at this intensity. Matthew was third strongest on record to hit the country, and the strongest to hit Haiti since Hurricane Cleo in 1964, which also struck as a Category 4. Haiti, the poorest country in the western hemisphere, was recovering from an ongoing cholera outbreak and a powerful earthquake in 2010, and many houses damaged during the earthquake were not rebuilt when Matthew struck. There were 25 humanitarian organizations working in impoverished Grand'Anse in southwestern Haiti before the storm made landfall. Ahead of the annual hurricane season, the World Food Programme (WFP) had pre-positioned 3,410 tons of food in the form of High Energy Biscuits, 30 tons of which was utilized immediately following the storm. Life-threatening rainfall was forecast to affect much of the nation, with accumulations averaging 38 to 64 cm (15 to 25 in) along the southern coast with isolated peaks up to 100 cm (40 in). A map of forecast rainfall totals from Hurricane Matthew for the Greater Antilles and the Bahamas. Peak accumulations in excess of 76 cm (30 in) were expected along the southern coast of Haiti's Tiburon Peninsula. On September 30, the Haitian government issued a tropical storm watch for Haiti's Tiburon Peninsula toward the border with the Dominican Republic, although the forecast at the time was for Matthew to pass over Jamaica. Following an eastward shift in Matthew's predicted track, this was changed to a hurricane watch and later warning that encompassed the entire country. The government activated its National Emergency Operations Center, ordered a halt to coastal shipping, and started issuing evacuation notices. Residents on outlying islands of Haiti were evacuated to the mainland. Provisional President Jocelerme Privert addressed the nation on October 2, urging those living along the coast and in poorly constructed homes to evacuate and comply with authorities. On the same day, the government issued a red alert, advising residents to listen to instructions from authorities, secure their property, and prepare food kits. 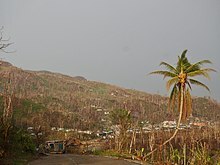 Although government officials held meetings on storm preparation, Radio France Internationale reported that Haiti did not have the logistical capability to handle a large-scale disaster. Only 576 shelters, with a collective capacity of 90,000 people, were listed for all of southern Haiti. Despite pleas from officials, many residents refused to leave their homes. A total of 1,300 shelters were readied with a total capacity of 390,000 people, insufficient for the population threatened in the storm path. Citing this problem and civic responsibility, officials asked residents in secure homes to welcome vulnerable neighbors. The Haitian government sent funds to 145 municipalities, after mayors complained that they had insufficient supplies. Government offices remained open during the storm, while schools were closed from October 3–10 to serve as shelters, causing the school calendar to be adjusted. By the day before the storm made landfall, 340,000 people had evacuated to these shelters. At least 500 people evacuated from Jérémie, and patients at the Les Cayes hospital were evacuated. In Ouest, which contains the capital Port-au-Prince, about 55,000 people evacuated ahead of the storm. Although civil protection officials took to the streets to warn people, many residents were unaware that Matthew was even approaching the country a day before its expected landfall. Evacuations continued through the hurricane's landfall with the total number of people in shelters reaching 9,280 by 2:00 a.m. local time on October 4. Hundreds of prisoners were also evacuated to safer areas during the storm passage. More than 18,000 volunteers and members of the Red Cross, community intervention teams, municipal committees, and local emergency services were readied to assist residents. According to the International Organization for Migration (IOM), 55,107 internally displaced persons remained in camps or hosting sites without adequate protection from the hurricane. Ahead of the storm, the Agency for Technical Cooperation and Development (ACTED) sent a crew of 35 people to seven shelters in southwestern Haiti, capable of disaster assessment and providing relief in the storm aftermath. The United Nations Disaster Assessment and Coordination also sent a team to assist the efforts of the Haitian government, and the United States Agency for International Development (USAID) also activated its crew within the country. Ahead of the storm, officials shut down the Hugo Chávez and Toussaint Louverture international airports, causing several flights to be canceled. The airport in Port-au-Prince remained closed until October 6, only allowing in planes carrying humanitarian aid. Officials also halted travel by cars during the storm's passage until October 5. Hurricane Matthew made landfall over southwestern Haiti as a powerful Category 4 hurricane on the morning of October 4. According to UNOSAT, Matthew affected about 1.125 million people with hurricane–force winds – at least 119 km/h (74 mph) – mostly in Sud. In Ouest, which contains the capital Port-au-Prince, nearly 4 million people experienced winds of at least 60 km/h (37 mph). Heavy rainfall ranged from 20 to 40 in (510 to 1,020 mm) across southern Haiti, with 24 hour totals of over 7.9 in (200 mm) around the Gulf of Gonâve. The storm surge, estimated around 9.8 ft (3 m), flooded at least 11 municipalities along the coast. Haiti politician François Anick Joseph described the storm effects in the southern portion of the country as "complete destruction". The World Bank and the Inter-American Development Bank estimated total damage around $1.89 billion. Nationwide, the hurricane severely damaged about 200,000 homes, with 90% of the houses along the southern coast destroyed. The storm knocked down 90% of coconut trees on the Tiburon Peninsula, and destroyed entire coffee and cocoa plantations. With most of the region's crops destroyed and 350,350 animals killed, residents in southern Haiti were left without a source of food. Matthew's strong winds knocked power lines and cell towers, which limited communications in the days following the storm, and left about 80% of the Tiburon Peninsula without power. A damaged antenna cut communications with Sud, and there were interruptions to the Digicel mobile phone network. Excessive flooding along 13 watersheds, as well as the heavy forestry damage, killed many forest and fruit species. The flooding produced mudslides that washed out roads and bridges. Along Route Nationale #2, the hurricane washed away the Petit-Goâve Bridge, which is the only bridge linking the nation's capital Port-au-Prince with southwestern Haiti. This meant that relief workers and supplies temporarily had to travel by air to reach the most affected areas. A temporary bridge to transport humanitarian relief was constructed by October 6. Across southern Haiti, the hurricane damaged 70% of the polling locations for the Haitian presidential election scheduled for October 9; as a result of the storm, the election was postponed to an undetermined date on October 5. Nationwide, Matthew damaged over 400 schools, while 150 other schools functioned as shelters for around 16,000 evacuees. Damage to schools affected about 130,000 children, many of whom had just started their school year, and were in need of a new location for their education. Of the nation's 15 main hospitals, one was destroyed and another four were damaged, with 35 medical clinics damaged, many of these were understaffed and unable to cope with the number of incoming patients. The hurricane's violent winds shredded vegetation across the Tiburon Peninsula, rendering the lush tropical landscape brown and barren. Before Matthew moved ashore, a sick woman died in Port-Salut due to high storm tides preventing her travel to a hospital, and a man was missing as a result of a boat wreck. Hurricane Matthew proved deadly for the country; one day after the storm made landfall, there were five known fatalities related to the storm, which rose to 108 by October 6, including 50 people killed in the coastal town of Roche-à-Bateaux. The death toll increased sharply to 842 by the next day, once the hardest hit areas of the Tiburon Peninsula were reached; many of the fatalities were due to people refusing to evacuate and who were trapped beneath the rubble of destroyed houses. This included 264 deaths in Sud, of whom 158 died in Les Anglais where Matthew moved ashore. There were at least 500 fatalities in Grand'Anse, and nationwide as many as 1,600 unconfirmed deaths. These numbers were lower according to the Haitian government, which reported a death toll of 546 as of October 15. Poorly constructed homes failed to withstand hurricane-force winds. Countless corrugated tin roofs fell victim to the storm. Grand'Anse bore the brunt of Hurricane Matthew, becoming isolated after communications networks were cut. Throughout the department, the hurricane destroyed or severely damaged 86,223 houses, which displaced about 99,400 families. Almost every tree in Grand'Anse was knocked down, while nearly all rivers were flooded. Nearly all of the crops in the department were destroyed, and about half of all livestock were killed. In Jérémie, the capital of the department, the strong winds ripped off nearly every roof, damaging 13,753 buildings. The hurricane decimated every building not made of concrete, including 90% of houses, and 80% of all structures. Floods in Jérémie inundated an orphanage, forcing 123 children to be evacuated, and 141 roads were damaged. In Sud, Hurricane Matthew severely damaged 15 of the 18 communes. The storm destroyed 95% of all shelters and at least 29,000 homes, along with most ports and fishing equipment. Damage was most significant in Les Cayes, capital of Sud. Ten hours of high wind gusts destroyed the roofs of most houses, shops, and service stations, including the main cathedral, injuring over 3,000 people. About 70–80% of the houses in the city lost their roof or were flooded, of which around 20% had collapsed walls. Several businesses were washed away in Les Cayes. Île-à-Vache, an island adjacent to Les Cayes, reported floods up to 4 ft (1.2 m) deep. Livestock were killed when farms "disappeared", according to a member of Heifer International. All crops in the city were damaged, and over 90% of the crops wrecked throughout the department. Significant damage to crops, fisheries, and livestock occurred in Nippes, Ouest, Sud-Est, Artibonite, and Nord-Ouest departments. High damage in Nippes left half of the population in need of humanitarian aid. In Grand-Goâve toward the eastern end of the Tiburon Peninsula, Matthew damaged or destroyed 500 houses, killing seven in the city. The road to Jacmel along the southeastern coast of Haiti was damaged, and many houses in the city were damaged. In Belle-Anse, located in the same department as Jacmel, Matthew destroyed about 80% of the crops. After the water flow increased at the Péligre Dam in Centre department, residents downstream were warned for potentially further flooding. In Gressier, the hurricane wrecked about 80% of agriculture plantations. Several neighborhoods around Port-au-Prince lost power and were flooded during the storm due to the rising levels of the Rivière Grise; a bridge along the river was closed due to floodwaters. Also in the city, the hurricane damaged or destroyed 352 shelters or tents for 14 camps of internally displaced people, along with 279 latrines. In Artibonite, Matthew flooded 1,350 houses and left 123,000 people without a source of food. The storm also destroyed about 60% of the crops in Nord-Ouest. On the offshore Gonâve Island, Matthew's strong winds destroyed the roofs of hundreds of homes and much of the island's roads and crops. The destructive effects of Hurricane Matthew left about 12.9% of Haiti's population – 1.4 million people – in need of humanitarian assistance, of whom about 40% were children and another 40% were women of reproductive age. It was the largest disaster in the country since the 2010 earthquake. Within six days of the storm's landfall, 175,509 people were residing in 224 temporary shelters, as people left their damaged houses for safety. There were reports that the shelters had insufficient water or food. Thousands of children were separated from their parents after the hurricane or were living in orphanages, lacking basic necessities. At least 2,000 of these children were evacuated by Save the Children. The nearly-destroyed city of Jérémie remained inaccessible to humanitarian aid groups for four days, lacking water and with little food for five days. Ganthier near the eastern border with the Dominican Republic suffered famine-like conditions and little water access in the aftermath of the hurricane. The price of rice and tin rose after the storm, leaving poor residents unable to afford food in areas that did not receive supplies. Damaged infrastructure and blocked roads prevented more expedient distribution of relief supplies, leaving storm victims without food or assistance for up to two weeks in isolated areas. By October 20, nearly 806,000 people were facing critical food shortages. Interim Haitian President Jocelerme Privert declared three days of national mourning, beginning on October 9. On the previous day, the country's travel ban by water was lifted, and communications were generally restored with the southwestern portion of the country. The Digicel network had restored 98% of the cellular network by October 15, including much of the worst hit areas. Within two weeks of the hurricane landfall, schools began to be reopened, and roads were gradually restored, which allowed for easier travel for humanitarian groups. By October 21, 80% of affected communities had road access restored. Based on the heavy storm damage, the Haitian government received over $20 million from the Caribbean Catastrophe Risk Insurance Facility Segregated Portfolio Company, which provides disaster insurance for nations in the Caribbean. On October 3, the Haitian government requested emergency assistance from the United Nations and other international agencies. On the same day, the International Charter Space and Major Disasters was activated, allowing charitable organizations to use satellite data for their relief work. Due to the hurricane damage, UN Secretary-General Ban Ki-moon recommended extending the peacekeeping force at existing levels until April 2017, and the Security Council passed Resolution 2313 on October 13 to extend the mission. The Secretary-General visited Haiti on October 15, taking an aerial tour of the damage and meeting local officials. Eight days earlier, the UN Central Emergency Response Fund provided a grant of $5 million toward rebuilding efforts, and the WFP began sending out 551 tons of food. By October 13, the WFP and other non-government organizations distributed 1,540 tons of food to nearly 58,000 people. In Port-au-Prince, earthquake survivors in damaged camps received 8,000 emergency kits from the IOM, while the United Nations peacekeeping force helped clear roads. The United Nations Development Programme provided short-term jobs to 1,416 people in Grand-Goâve to clear debris in their damaged villages, after 90% of people in the town lost their source of income. In the storm's aftermath, humanitarian agencies had about 400 operations throughout Haiti to provide relief to storm victims. Several non-government organizations worked to provide needs for storm victims, including ACTED, Action Against Hunger, All Hands Volunteers, CARE, Direct Relief, Lutheran World Relief, Mercy Corps, Oxfam, Plan International, Project HOPE, Tzu Chi, World Concern, and World Vision International. These agencies provided water, food, blankets, medicine, plastic sheets, and water chlorination tablets. Direct Relief sent 86 pallets of medical supplies to Haiti worth $13 million. Catholic Relief Services provided $5 million toward disaster relief. Relief agencies were concerned that the aid would not reach those most in need, and that reconstruction would not have input from local officials. By eight days after the storm, people began rebuilding their houses in Les Cayes and on the road west from the city, although the supplies were insufficient for the population. Concern Worldwide brought relief supplies to Gonâve Island by boat, including tarps, blankets, and water tablets. To determine the scale of the damage, the Caribbean Disaster Emergency Management Agency sent a team of six people assisting the efforts of the Emergency Operation Centre in Jérémie and Les Cayes. The Pan American Health Organization sent six teams of health experts to the hardest hit areas, along with medicine and other supplies. The International Red Cross and Red Crescent Movement approved an appeal of CHF5 million to help 13,500 families, sending its first flight of aid on October 9. Flooding rains affected Haiti on October 21, disrupting relief efforts. On October 9, the United Nations launched an emergency appeal for aid for the country, requesting nearly US$120 million to provide for the needs of the storm victims. Within ten days, governments and relief agencies had pledged US$40.1 million toward the recovery. The government of neighboring Dominican Republic provided wood, medicine, and mattresses, and asked that its citizens contribute what they can to the recovery. The island of Dominica donated US$100,000 to Haiti as well as the Bahamas, which was later struck by Matthew. The government of Venezuela sent two boats with 20 tons of supplies, including medicine, water, and food. Canada donated C$6.08 million in aid toward replenishing drinking water. The United States Navy sent three vessels to Haiti to help respond to the storm – the USS George Washington, USS Mesa Verde, and the USNS Comfort, the last of which functions as a hospital ship. The Mesa Verde, stationed off Haiti's southern coast, had personnel and supplies for areas inaccessible by road. Due to improved road access and logistical support, the American military finished their operations by October 21. In total, the American government provided $37.9 million to fund its efforts in the country. The first flight of American aid arrived in Port-au-Prince on October 8, beginning the transfer of 480 tons of supplies. Outside of the Americas, the European Union provided €1.755 million in funds. The United Kingdom pledged £8 million in funds toward providing temporary shelters that had equipment to purify water, as well as cholera prevention. Ireland provided €1.7 million toward the recovery efforts. Two Dutch ships helped relief operations in areas inaccessible by road. France sent two reconnaissance helicopters to survey the affected areas, as well as two water purification systems capable of producing 66,000 gallons (250,000 litres) each per day, valued at €814,000. The Spanish Red Cross sent 5 tons of relief supplies, Estonia donated €50,000 to the WHO, and the Luxembourg Red Cross flew a team of disaster experts. Switzerland also flew a team of experts in shelter-building, security, and water restoration, allocating CHF2 million toward the project. Japan granted US$3 million and donated tents through its International Cooperation Agency. South Korea donated US$350,000, and the Singapore Red Cross provided US$30,000 toward medicine and water. Australia donated A$3.5 million to UNICEF and the IOM. The ongoing cholera outbreak worsened following the storm, with 1,351 new cases reported by October 21. The storm destroyed 34 cholera treatment centers nationwide, including about 75% of such facilities in Grand'Anse and Sud departments. By October 10, Haitian doctors warned of a "Cholera crisis" in the hurricane's wake. In Port-a-Piment, at least 60 people were treated for the disease, with 4 dying from it. The town's hospital nearly ran out of supplies by this time. In the nearby village of Randel, more than 100 people were infected and at least 25 succumbed to the illness. The Port-Salut hospital received around 100 patients in the days after the storm, 85% of whom due to storm-related injuries. It recorded its first cholera death from the storm on October 9, as reports of the disease increased in the nation. The roads around St. Boniface Hospital in Sud, which has a cholera treatment center, were washed out, making it difficult for the hospital to get supplies. In addition to facing the cholera spread, health officials also worked to contain the Zika outbreak in the aftermath of the storm's flooding. Relief organizations sent doctors and medical teams to take care of medical needs, including treating for cholera. By October 20, Médecins Sans Frontières had provided medical care for 1,614 people. Civil Protection officials advised residents to only drink treated water, due to the potential for disease spreading by water. The Pan American Health Organization sent epidemiologists to monitor and mitigate the spread of cholera following the storm. The World Health Organization flew around 1 million anti-cholera vaccines to the country. On October 9, the United Nations transferred $8 million to UNICEF toward preventing the spread of disease. A week later, Secretary-General Ban Ki-moon established the UN Haiti Cholera Response Multi-Partner Trust Fund, which provided and managed resources toward fighting cholera. A team from the Association of Medical Doctors of Asia assisted the hospital in Moron, Grand'Anse. ^ a b c d e f g Stewart, Stacy R (April 3, 2017). Tropical Cyclone Report: Hurricane Matthew 2016 (PDF) (Technical report). United States National Hurricane Center. Retrieved May 14, 2017. ^ a b Haiti: IOM Appeal Haiti/ Hurricane Matthew (9 October 2016). International Organization for Migration (Report). ReliefWeb. October 9, 2016. Retrieved October 14, 2016. ^ a b Doyle Rice (October 4, 2016). "Hurricane Matthew makes landfall in Haiti". USAToday. Retrieved October 7, 2016. ^ Hurricane Matthew in Haiti: "A cholera epidemic is the first thing to avoid". Solidarités International (Report). ReliefWeb. October 5, 2016. Retrieved October 9, 2016. ^ Haiti: Hurricane Matthew - Department Profile, Grande’Anse, 21 October 2016 (PDF). Assessment Capacities Project (Report). ReliefWeb. October 21, 2016. Retrieved October 22, 2016. ^ a b c Haiti : dans le sillage de l'ouragan Matthew. World Food Programme (Report) (in French). October 7, 2016. Retrieved October 7, 2016. ^ Hurricane Matthew - Situation Report No. 4, as of 6 October 2016 – (1700 hours EST) (PDF). United Nations Office for the Coordination of Humanitarian Affairs (Report). ReliefWeb. October 6, 2016. Retrieved October 10, 2016. ^ Howard Campbell (October 1, 2016). "Hurricane Matthew Soaks Colombia, Heads for Jamaica, Haiti". Kingston, Jamaica: ABC News. Associated Press. Retrieved October 2, 2016. ^ Richard Pasch (October 2, 2016). Hurricane Matthew Intermediate Public Advisory Number 18A (Report). Miami, Florida: National Hurricane Center. Retrieved October 2, 2016. ^ Michael Brennan (September 30, 2016). Hurricane Matthew Public Advisory Number 11 (Report). Miami, Florida: National Hurricane Center. Retrieved October 2, 2016. ^ Michael Brennan (October 1, 2016). Hurricane Matthew Public Advisory Number 14 (Report). Miami, Florida: National Hurricane Center. Retrieved October 2, 2016. ^ Michael Brennan (October 1, 2016). Hurricane Matthew Public Advisory Number 15 (Report). Miami, Florida: National Hurricane Center. Retrieved October 2, 2016. ^ Daniel Brown and Robbie Berg (October 2, 2016). Hurricane Matthew Public Advisory Number 17 (Report). Miami, Florida: National Hurricane Center. Retrieved October 2, 2016. ^ Haïti Ouragan Matthew Rapport de situation #1, 1er octobre 2016. Government of Haiti (Report) (in French). ReliefWeb. October 1, 2016. Retrieved October 7, 2016. ^ "Hurricane Matthew: Evacuations in Haiti as powerful storm looms". BBC. October 2, 2016. Retrieved October 2, 2016. ^ a b c "Matthew : Schools closed on Monday and Tuesday – Address to the Nation of Privert". Haiti Libre. October 3, 2016. Retrieved October 3, 2016. ^ Alerte rouge sur Haïti à l'approche de l'ouragan Matthew. AlterPress (Report) (in French). October 2, 2016. Retrieved October 8, 2016. ^ Amélie Baron (October 2, 2016). "Haïti démunie face à l'arrivée de l'ouragan Matthew" (in French). Radio France Internationale. Retrieved October 2, 2016. ^ "Haiti – Flash : Matthew the situation this morning". Haiti Libre. October 3, 2016. Retrieved October 3, 2016. ^ "Haiti – Flash : Hurricane Matthew en route to Haiti, first effects tonight". Haiti Libre. October 2, 2016. Retrieved October 3, 2016. ^ a b c d Amelie Baron (October 2, 2016). "L'ouragan Matthew se rapproche de Cuba, Haïti et la Jamaïque" (in French). Agence France-Presse. ^ La situation se détériore rapidement en Haïti sous l'effet potentiellement désastreux de Matthew (PDF). AlterPress (Report) (in French). October 4, 2016. Retrieved October 8, 2016. ^ Haïti-Ouragan Matthew : Reprise des activités scolaires, le 10 octobre 2016, en raison des intempéries. AlterPress (Report) (in French). ReliefWeb. October 5, 2016. Retrieved October 9, 2016. ^ a b Hurricane Matthew - Situation Report No. 1, as of 3 October 2016 – (1700 hours EST). United Nations Office for the Coordination of Humanitarian Affairs (Report). ReliefWeb. October 3, 2016. Retrieved October 8, 2016. ^ "Huracán Matthew deja 1 muerto en Haití y 8 mil 500 evacuados en República Dominicana" (in Spanish). RCN Radio. Agencia EFE. October 3, 2016. Retrieved October 3, 2016. ^ a b Caribbean - Hurricane Matthew (ECHO, GDACS, NOAA, Meteo Haiti, INSMET, Local Media) (ECHO Daily Flash of 3 October 2016). European Commission's Directorate-General for European Civil Protection and Humanitarian Aid Operations (Report). ReliefWeb. October 3, 2016. Retrieved October 8, 2016. ^ Wright, Pam (October 3, 2016). "Hurricane Matthew Kills Two Fishermen in Haiti; They 'Took Risks to Feed Their Families,' Official Says". The Weather Channel. Retrieved October 3, 2016. ^ "Huracán Mathew toca tierra en Cuba tras dejar muertos por su paso por Haití" (in Spanish). CNN. October 4, 2016. Retrieved October 6, 2016. ^ Ouragan Matthew Rapport de situation #3. Government of Haiti (Report) (in French). ReliefWeb. October 6, 2016. Retrieved October 9, 2016. ^ "Haiti – Matthew : 55,107 persons in camps in Haiti without protection..." Haiti Libre. October 2, 2016. Retrieved October 2, 2016. ^ Les équipes d'urgence d'ACTED en Haïti mobilisées en prévision du passage imminent de l'ouragan Matthew. Agency for Technical Cooperation and Development (Report) (in French). ReliefWeb. October 3, 2016. Retrieved October 8, 2016. ^ Caribbean – Hurricane Matthew Fact Sheet #1, Fiscal Year (FY) 2017 (PDF). United States Agency for International Development (Report). ReliefWeb. October 4, 2016. Retrieved October 9, 2016. ^ "Ouragan Matthew Rapport de situation #2". Government of Haiti (in French). ReliefWeb. October 2, 2016. Retrieved October 8, 2016. ^ a b Hurricane Matthew - Situation Report No. 3, as of 5 October 2016 – (1700 hours EST) (PDF). United Nations Office for the Coordination of Humanitarian Affairs (Report). ReliefWeb. October 5, 2016. Retrieved October 9, 2016. ^ a b c d Hurricane Matthew - Situation Report No. 2, as of 4 October 2016 – (1700 hours EST) (PDF). United Nations Office for the Coordination of Humanitarian Affairs (Report). ReliefWeb. October 4, 2016. Retrieved October 9, 2016. ^ UNOSAT Preliminary Exposure-Impact Analysis - 07 October 2016 Tropical Cyclone Matthew-16. UNOSAT (Report). ReliefWeb. October 7, 2016. Retrieved October 11, 2016. ^ a b c IOM Haiti: Hurricane Matthew Sitrep #1, 5 October 2016 (PDF). International Organization for Migration (Report). ReliefWeb. October 5, 2016. Retrieved October 10, 2016. ^ Haiti: Flash Appeal October 2016. United Nations Office for the Coordination of Humanitarian Affairs (Report). ReliefWeb. October 10, 2016. Retrieved October 11, 2016. ^ Haïti Ouragan Matthew: la CRS prépare une intervention d'aide d'urgence. Swiss Red Cross (Report). ReliefWeb. October 5, 2016. Retrieved October 10, 2016. ^ UNICEF Haiti: Hurricane Matthew - Situation Report #3, 5 October 2016. UNICEF (Report). ReliefWeb. October 5, 2016. Retrieved October 9, 2016. ^ a b c d Kerry Sheridan; Daniel Woolls (October 6, 2016). "Millions in US told to flee hurricane, Haiti toll over 100". ReliefWeb. Agence France-Presse. Retrieved October 9, 2016. ^ "Hurricane Matthew damage tally in Haiti nearly $2 bn". Yahoo! News. October 29, 2016. ^ a b Hurricane Matthew - 14 October 2016 – Report No. 1 (PDF). Center for Disaster Management and Risk Reduction Technology (Report). October 14, 2016. Retrieved October 18, 2016. ^ Haiti Hurricane Matthew Situation Report #04 (08 October 2016). World Food Programme (Report). October 8, 2016. Retrieved October 11, 2016. ^ IOM Haiti: Hurricane Matthew Sitrep #3, 7 October 2016. International Organization for Migration (Report). ReliefWeb. October 7, 2016. Retrieved October 14, 2016. ^ Haïti-Matthew: Bientôt un plan de relèvement dans le secteur agricole, annonce le Marndr. AlterPress (Report) (in French). October 19, 2016. Retrieved October 21, 2016. ^ a b c Humanity Road – Haiti – Hurricane Matthew Sitrep #2, October 5, 2016 (PDF). Humanity Road (Report). ReliefWeb. October 5, 2016. Retrieved October 10, 2016. ^ Haiti - Situation report - 12 October 2016. Food and Agriculture Organization of the United Nations (Report). October 12, 2016. Retrieved October 17, 2016. ^ a b c d e Rebecca Hersher (October 6, 2016). "In Haiti, Slow Revelations About The Scale Of Hurricane Destruction". National Public Radio. Retrieved October 7, 2016. ^ a b Hurricane Matthew Situation Report No. 6 - Date: 05 October 2016 (14:00 EST) (PDF). Pan American Health Organization (Report). ReliefWeb. October 5, 2016. Retrieved October 9, 2016. ^ Haïti-Matthew : Couverture végétale ravagée: 12,079 km2 de bassins versants affectés, soit 43.6% du territoire. AlterPress (Report) (in French). October 16, 2016. Retrieved October 18, 2016. ^ a b c Rebecca Hersher (October 5, 2016). "'We Were Already In A Cholera Crisis'; Hurricane Pummels Haiti, Heads North". National Public Radio. Retrieved October 7, 2016. ^ Haiti: Hurricane Matthew Situation Update (04 October 2016) (PDF). World Food Programme (Report) (in French). October 4, 2016. Retrieved October 9, 2016. ^ a b c UNICEF Haiti: Haiti Hurricane Matthew - Situation Report #4, 6 October 2016 (PDF). UNICEF (Report). October 6, 2016. Retrieved October 10, 2016. ^ a b Haïti Conseil de sécurité: la prorogation de la MINUSTAH est d'autant plus importante suite au passage de Matthew, selon l'ONU. UN Radio (Report) (in French). ReliefWeb. October 11, 2016. Retrieved October 17, 2016. ^ Haiti, Cuba - Hurricane MATTHEW (ECHO, Ministry of Education of Haiti, CNM) (ECHO Daily Flash of 21 October 2016). European Commission's Directorate-General for European Civil Protection and Humanitarian Aid Operations (Report). ReliefWeb. October 21, 2016. Retrieved October 22, 2016. ^ Half a million children live in areas hardest hit by Hurricane Matthew in Haiti – UNICEF. UNICEF (Report). October 7, 2016. Retrieved October 10, 2016. ^ Cornelia Walther (October 6, 2016). After the storm is before the storm. UNICEF (Report). ReliefWeb. Retrieved October 10, 2016. ^ Thousands of children out of school in Haiti in wake of Hurricane Matthew. Save the Children (Report). ReliefWeb. October 6, 2016. Retrieved October 10, 2016. ^ International Medical Corps: Hurricane Matthew Situation Report #2 October 9, 2016. International Medical Corps (Report). ReliefWeb. October 9, 2016. Retrieved October 14, 2016. ^ Caribbean – Hurricane Matthew Fact Sheet #4, Fiscal Year (FY) 2017. United States Agency for International Development (Report). ReliefWeb. October 12, 2016. Retrieved October 17, 2016. ^ a b c Joshua Partlow (October 9, 2016). "In the wake of Matthew, Haitian towns struggle with cholera". The Washington Post. Retrieved October 10, 2016. ^ Amelia Baron (October 4, 2016). "L'ouragan Matthew fait ses premières victimes en s'approchant de Haïti et Cuba" (in French). ReliefWeb. Agence France-Presse. Retrieved October 8, 2016. ^ a b c Amelie Baron (October 5, 2016). "Hurricane Matthew pummels Haiti and Cuba, evacuations ordered in US". ReliefWeb. Agence France-Presse. Retrieved October 8, 2016. ^ Azam Ahmed (October 7, 2016). "Hurricane Matthew Makes Old Problems Worse for Haiti". New York Times. Retrieved October 10, 2016. ^ Matthew : La communauté internationale annonce des aides humanitaires à Haïti, dans un contexte d'inquiétudes. AlterPress (Report) (in French). October 7, 2016. Retrieved October 10, 2016. ^ Health Conditions Worsen as Aid Trickles Into Remote Haiti. Voice of America (Report). ReliefWeb. October 11, 2016. Retrieved October 17, 2016. ^ Haiti: Hurricane Matthew - Situation Report No. 11 (15 October 2016). United Nations Office for the Coordination of Humanitarian Affairs (Report). ReliefWeb. Retrieved October 18, 2016. ^ a b UNICEF Haiti: Haiti Hurricane Matthew - Situation Report #6, 10 October 2016. UNICEF (Report). ReliefWeb. October 10, 2016. Retrieved October 13, 2016. ^ Situation Update: 20% of Haitian population affected by Hurricane Matthew. Agency for Technical Cooperation and Development (Report). ReliefWeb. October 10, 2016. Retrieved October 14, 2016. ^ a b Haiti Hurricane Matthew Situation Report #05 (09 October 2016). World Food Programme (Report). October 9, 2016. Retrieved October 14, 2016. ^ a b Hurricane Matthew Preliminary Satellite Based Damage Assessment Report: Grand’Anse Département, Haiti, 14 Oct 2016. UNOSAT (Report). ReliefWeb. October 14, 2016. Retrieved October 18, 2016. ^ a b Haiti update: HI mobile team treat the injured. Handicap International (Report). ReliefWeb. October 19, 2016. Retrieved October 21, 2016. ^ a b c d e Humanity Road – Haiti – Hurricane Matthew Sitrep #1, October 4, 2016 (PDF). Humanity Road (Report). ReliefWeb. October 4, 2016. Retrieved October 9, 2016. ^ Humanity Road – Haiti – Hurricane Matthew Sitrep #4 - (period covered: October 4-7, 2016) (PDF). Humanity Road (Report). ReliefWeb. October 7, 2016. Retrieved October 11, 2016. ^ "Hurricane Matthew: What we know". ReliefWeb. Agence France-Presse. October 7, 2016. Retrieved October 10, 2016. ^ a b Hurricane Matthew Situation Report No. 7 - Date: 06 October 2016 (18:00 EST) (PDF). Pan American Health Organization (Report). ReliefWeb. October 6, 2016. Retrieved October 10, 2016. ^ Amelie Baron (October 6, 2016). ""La première aide c'est nous": après Matthew, l'entraide des Haïtiens" (in French). ReliefWeb. Agence France-Presse. Retrieved October 10, 2016. ^ a b Haïti : Premier bilan après le passage de l'ouragan Matthew. SOS Children's Villages International (Report) (in French). ReliefWeb. October 7, 2016. Retrieved October 7, 2016. ^ ACAPS Briefing Note 5 : Haiti Hurricane Matthew – 14 October 2016. Assessment Capacities Project (Report). ReliefWeb. October 14, 2016. Retrieved October 18, 2016. ^ Haiti - Situation report - 18 October 2016. Food and Agriculture Organization of the United Nations (Report). ReliefWeb. Retrieved October 21, 2016. ^ ACT Alliance Preliminary Appeal: Haiti – Hurricane Matthew Response – HTI161. ACT Alliance (Report). ReliefWeb. October 12, 2016. Retrieved October 17, 2016. ^ Haiti: Rising after the storm. United Nations Development Programme (Report). ReliefWeb. October 9, 2016. Retrieved October 13, 2016. ^ Haiti: Malteser International provides emergency aid to devastated areas. Malteser (Report). ReliefWeb. October 10, 2016. Retrieved October 14, 2016. ^ Amelie Baron (October 4, 2016). "Après Matthew, la vie des Haïtiens est toujours menacée" (in French). ReliefWeb. Agence France-Presse. Retrieved October 8, 2016. ^ Haïti toujours en danger, 24 heures après les premières manifestations de l'ouragan Matthew. AlterPress (Report) (in French). October 4, 2016. Retrieved October 9, 2016. ^ IOM Haiti: Hurricane Matthew Sitrep #2, 6 October 2016. International Organization for Migration (Report). ReliefWeb. October 6, 2016. Retrieved October 11, 2016. ^ UNICEF Haiti: Humanitarian Situation Report on Hurricane Matthew #8, 13 October 2016. UNICEF (Report). October 13, 2016. Retrieved October 18, 2016. ^ Haiti Hurricane Matthew Situation Report #06 (10 October 2016). World Food Programme (Report). October 10, 2016. Retrieved October 15, 2016. ^ a b Distributions underway on La Gonâve island. Concern Worldwide (Report). ReliefWeb. October 14, 2016. Retrieved October 18, 2016. ^ a b Haiti: Hurricane Matthew - Situation Report No. 5 (as of 9 October 2016). United Nations Office for the Coordination of Humanitarian Affairs (Report). ReliefWeb. October 9, 2016. Retrieved October 13, 2016. ^ Haiti: Hurricane Matthew - Situation Report No. 14 (21 October 2016). United Nations Office for the Coordination of Humanitarian Affairs (Report). ReliefWeb. October 21, 2016. Retrieved October 22, 2016. ^ Haiti: Hurricane Matthew - Situation Report No. 6 (10 October 2016). United Nations Office for the Coordination of Humanitarian Affairs (Report). ReliefWeb. October 10, 2016. Retrieved October 15, 2016. ^ Haiti: Hurricane Matthew - Situation Report No. 03 (as of 07 October 2016) (PDF). United Nations Office for the Coordination of Humanitarian Affairs (Report). ReliefWeb. October 8, 2016. Retrieved October 11, 2016. ^ Children exceptionally vulnerable in the wake of Hurricane Matthew in Haiti. Save the Children (Report). ReliefWeb. October 9, 2016. Retrieved October 13, 2016. ^ Ouragan Matthew : la réouverture des voix maritimes va permettre l'acheminement de l'aide. Handicap International (Report). ReliefWeb. October 8, 2016. Retrieved October 12, 2016. ^ Needs remain huge in Haiti after Hurricane Matthew. International Federation of Red Cross And Red Crescent Societies (Report). ReliefWeb. October 9, 2016. Retrieved October 13, 2016. ^ Haïti-Matthew : Situation de famine à Bois-Léger (Ganthier), rapporte la plateforme Garr. AlterPresse (Report) (in French). ReliefWeb. October 13, 2016. Retrieved October 18, 2016. ^ a b Marc Burleigh (October 12, 2016). "Haitians rebuild as aid effort gains traction". ReliefWeb. Agence France-Presse. Retrieved October 17, 2016. ^ Marc Burleigh (October 10, 2016). "Haiti devastation slows aid effort". Agence France-Presse. ^ Haiti: cholera and food shortages threaten Hurricane Matthew survivors. Oxfam (Report). ReliefWeb. October 10, 2016. Retrieved October 14, 2016. ^ Haiti: Delivering aid to hard-to-reach communities is the key priority. International Federation of Red Cross And Red Crescent Societies (Report). ReliefWeb. October 18, 2016. Retrieved October 21, 2016. ^ Point de situation : Près de 806 000 personnes en situation d'urgence alimentaire en Haïti. Agency for Technical Cooperation and Development (Report) (in French). ReliefWeb. October 20, 2016. Retrieved October 22, 2016. ^ Amélie Baron (October 9, 2016). "Haiti mourns hurricane dead as Matthew dwindles" (in French). Agence France-Presse. Retrieved October 11, 2016. ^ Ouragan Matthew - Rapport de situation #6 [Vendredi 7 octobre 2016 (minuit)]language=French. Government of Haiti (Report). ReliefWeb. October 7, 2016. Retrieved October 13, 2016. ^ Haiti: Hurricane Matthew: Digicel Network Functionality, 15 October 2016. Flowminder Foundation (Report). ReliefWeb. October 15, 2016. Retrieved October 18, 2016. ^ a b UNICEF Haiti: Humanitarian Situation Report on Hurricane Matthew #10, 20 October 2016 (PDF). United Nations Children's Fund (Report). ReliefWeb. October 20, 2016. Retrieved October 22, 2016. ^ a b c Caribbean – Hurricane Matthew Fact Sheet #7, Fiscal Year (FY) 2017 (PDF). United States Agency for International Development (Report). ReliefWeb. October 21, 2016. Retrieved October 22, 2016. ^ CCRIF Ready to Pay Haiti a little over US$20 Million Following Passage of Hurricane Matthew. Caribbean Catastrophe Risk Insurance Facility (Report). ReliefWeb. October 5, 2016. Retrieved October 10, 2016. ^ Charter activated for Hurricane in Haiti, the Dominican Republic, Cuba, the Bahamas and the United States. United Nations Office for Outer Space Affairs (Report). ReliefWeb. October 6, 2016. Retrieved October 10, 2016. ^ Security Council Extends Mandate of United Nations Mission in Haiti, Unanimously Adopting Resolution 2313 (2016). United Nations Security Council (Report). ReliefWeb. October 13, 2016. Retrieved October 18, 2016. ^ "Ban Ki-moon en visite en Haïti après le passage de l'ouragan Matthew". UN News Service. ReliefWeb. October 15, 2016. Retrieved October 18, 2016. ^ CERF allocates funds to kick start assistance following Hurricane Matthew and provides loan to boost ongoing response to cholera epidemic in Haiti. United Nations Office for the Coordination of Humanitarian Affairs (Report). ReliefWeb. October 7, 2016. Retrieved October 11, 2016. ^ Haiti Hurricane Matthew Situation Report #07 (11 October 2016). World Food Programme (Report). October 11, 2016. Retrieved October 17, 2016. ^ Haiti - Hurricane Matthew: Emergency Dashboard (17 October 2016) (PDF). World Food Programme (Report). ReliefWeb. October 17, 2016. Retrieved October 22, 2016. ^ IOM distributes emergency kits to families affected by Hurricane Matthew in Haiti. International Organization for Migration (Report). ReliefWeb. October 7, 2016. Retrieved October 13, 2016. ^ Haïti : le relèvement après Matthew démarre. United Nations Development Programme (Report) (in French). ReliefWeb. October 19, 2016. Retrieved October 21, 2016. ^ Haiti: Hurricane Matthew (as of 14 Oct 2016). United Nations Office for the Coordination of Humanitarian Affairs (Report). ReliefWeb. October 13, 2016. Retrieved October 18, 2016. ^ Update: Preparing to meet emergency needs after Hurricane Matthew. Mercy Corps (Report). ReliefWeb. October 5, 2016. Retrieved October 9, 2016. "Hurricane Matthew: 350,000 people in need of assistance, 15,623 are displaced". United Nations Office for the Coordination of Humanitarian Affairs. October 5, 2016. Retrieved October 9, 2016. Hurricane Matthew Blasts Haiti: 750,000 People Require Assistance. Action Against Hunger (Report). ReliefWeb. October 8, 2016. Retrieved October 9, 2016. Hurricane Matthew/Haiti Update from All Hands Volunteers. All Hands Volunteers (Report). ReliefWeb. October 8, 2016. Retrieved October 11, 2016. Urgence Haïti – La réponse d'ACTED à l'ouragan Matthew. Agency for Technical Cooperation and Development (Report) (in French). ReliefWeb. October 7, 2016. Retrieved October 10, 2016. Haiti hurricane: CARE distributes emergency aid. CARE (Report). ReliefWeb. October 11, 2016. Retrieved October 17, 2016. Lutheran World Relief Providing Emergency Relief to Haitian Families Affected by Hurricane Matthew. Lutheran World Relief (Report). ReliefWeb. October 14, 2016. Retrieved October 17, 2016. Devastation caused by Hurricane Matthew is likely to worsen – Oxfam delivers water purification kits. Oxfam (Report). ReliefWeb. October 7, 2016. Retrieved October 10, 2016. Haiti's Interim President Briefs Project HOPE on Hurricane's Impact. Project HOPE (Report). ReliefWeb. October 7, 2016. Retrieved October 11, 2016. Haiti: Hurricane Matthew Report 1. Buddhist Tzu Chi Foundation (Report). ReliefWeb. October 18, 2016. Retrieved October 18, 2016. World Concern aids Hurricane Matthew survivors in Haiti. World Concern (Report). ReliefWeb. October 12, 2016. Retrieved October 17, 2016. ^ a b Hurricane Matthew: Direct Relief Responds in U.S., Haiti. Direct Relief (Report). ReliefWeb. October 6, 2016. Retrieved October 10, 2016. ^ Catholic Relief Services Commits $5 Million to Hurricane Matthew Response in Haiti. Catholic Relief Services (Report). ReliefWeb. October 7, 2016. Retrieved October 10, 2016. ^ Mise en garde à propos de l'aide humanitaire pour Haiti apres le passage de Matthew. AlterPress (Report) (in French). October 6, 2016. Retrieved October 10, 2016. ^ CDEMA deploys response teams to Haiti and The Bahamas following impact of Hurricane Matthew. Caribbean Disaster Emergency Management Agency (Report). ReliefWeb. October 6, 2016. Retrieved October 7, 2016. ^ Red Cross aid flight arrives to Haiti. United Nations Office for the Coordination of Humanitarian Affairs (Report). ReliefWeb. October 9, 2016. Retrieved October 13, 2016. ^ Haiti Hurricane Matthew Situation Report #13 (21 October 2016). World Food Programme (Report). ReliefWeb. October 21, 2016. Retrieved October 23, 2016. ^ a b Hurricane Matthew - Situation Report No. 6 as of 9 October 2016 (1700 hours EST). United Nations Office for the Coordination of Humanitarian Affairs (Report). ReliefWeb. October 9, 2016. Retrieved October 13, 2016. ^ Haiti: Humanitarian actors appeal for US $119 million to cover vital needs of 750,000 persons affected by Matthew. United Nations Office for the Coordination of Humanitarian Affairs (Report). ReliefWeb. October 10, 2016. Retrieved October 14, 2016. ^ Haiti: Flash Appeal 2016 - Funding Overview (as of 19 October 2016) (PDF). United Nations Office for the Coordination of Humanitarian Affairs (Report). ReliefWeb. October 19, 2016. Retrieved October 22, 2016. ^ "Ayuda del Gobierno dominicano a Haití para afectados por el ciclón llegará el miércoles". Redhum (in Spanish). ReliefWeb. Diario Libre. October 10, 2016. Retrieved October 15, 2016. ^ Dominica Gives Over EC $500K to Assist Haiti and Bahamas Post Matthew. Government of Dominica (Report). ReliefWeb. October 18, 2016. Retrieved October 21, 2016. ^ Envían desde Venezuela ayuda humanitaria a Haití. Government of Haiti (Report) (in French). ReliefWeb. October 5, 2016. Retrieved October 9, 2016. ^ Le Canada fournit une aide humanitaire supplémentaire à Haïti. Government of Canada (Report). ReliefWeb. October 14, 2016. Retrieved October 17, 2016. ^ Caribbean – Hurricane Matthew Fact Sheet #3, Fiscal Year (FY) 2017. United States Agency for International Development (Report). ReliefWeb. October 9, 2016. Retrieved October 13, 2016. ^ Haiti: Hurricane Matthew - Situation Report No. 4 (as of 8 October 2016). United Nations Office for the Coordination of Humanitarian Affairs (Report). ReliefWeb. October 8, 2016. Retrieved October 11, 2016. ^ Statement by USAID administrator Gayle Smith on escalating humanitarian response to Hurricane Matthew. United States Agency for International Development (Report). ReliefWeb. October 8, 2016. Retrieved October 11, 2016. ^ The European Union steps up support for victims of deadly hurricane Matthew. European Commission's Directorate-General for European Civil Protection and Humanitarian Aid Operations (Report). ReliefWeb. October 7, 2016. Retrieved October 10, 2016. ^ UK provides support and expertise to help victims of Hurricane Matthew. Department for International Development (Report). ReliefWeb. October 7, 2016. Retrieved October 10, 2016. ^ UK tackles threat of major cholera spike in the wake of Hurricane Matthew. Department for International Development (Report). ReliefWeb. October 16, 2016. Retrieved October 17, 2016. ^ Ministers Flanagan and McHugh announce additional €1.5 million humanitarian funding for Haiti. Government of Ireland (Report). ReliefWeb. October 21, 2016. Retrieved October 22, 2016. ^ Haiti - Hurricane Matthew – Humanitarian assistance (October 6, 2016). Government of France (Report). ReliefWeb. October 6, 2016. Retrieved October 10, 2016. ^ Amelie Baron; Marc Burleigh. Haiti death toll hits 473 as survivors plead for aid (Report). ReliefWeb. Agence France-Presse. Retrieved October 17, 2016. ^ Haïti - Aide humanitaire française - Point de situation (12 octobre 2016). Government of France (Report). ReliefWeb. October 12, 2016. Retrieved October 17, 2016. ^ Cruz Roja Española y Cruz Roja Dominicana coordinan el envío de plantas potabilizadoras a Haití. Cruz Roja Española (Report) (in Spanish). ReliefWeb. October 10, 2016. Retrieved October 14, 2016. ^ Ministry of Foreign Affairs allocates 50,000 euros to help alleviate the aftermath of hurricane Matthew. Government of Estonia (Report). ReliefWeb. October 21, 2016. Retrieved October 22, 2016. ^ Ouragan Haïti : La Croix-Rouge luxembourgeoise déploie deux membres de son équipe d'urgence sur place. Croix-Rouge luxembourgeoise (Report) (in French). ReliefWeb. October 14, 2016. Retrieved October 18, 2016. ^ Switzerland mobilises assistance for Hurricane Matthew survivors in Haiti. Swiss Agency for Development and Cooperation (Report). ReliefWeb. October 7, 2016. Retrieved October 14, 2016. ^ Emergency Grant Aid in response to Hurricane "Matthew" disaster in the Republic of Haiti. Government of Japan (Report). ReliefWeb. October 21, 2016. Retrieved October 22, 2016. ^ Emergency Assistance in response to Hurricane "Matthew" disaster in the Republic of Haiti. Government of Japan (Report). ReliefWeb. October 7, 2016. Retrieved October 10, 2016. ^ ROK to Provide Hurricane-hit Haiti with US$500,000 in Humanitarian Assistance. Republic of Korea (Report). ReliefWeb. October 12, 2016. Retrieved October 22, 2016. ^ Singapore Red Cross contributes US$30,000 for Hurricane Matthew relief. Singapore Red Cross (Report). ReliefWeb. October 7, 2016. Retrieved October 11, 2016. ^ Australia: Humanitarian assistance to Haiti. Government of Australia (Report). ReliefWeb. October 19, 2016. Retrieved October 21, 2016. ^ Haiti: Hurricane Matthew - Situation Report No. 12 (17 October 2016). United Nations Office for the Coordination of Humanitarian Affairs (Report). ReliefWeb. October 17, 2016. Retrieved October 18, 2016. ^ Fadéla Chaib press notes on Haiti – Fadéla Chaib, WHO spokesperson (Report). ReliefWeb. October 14, 2016. Retrieved October 18, 2016. ^ Alastair Jamieson (October 10, 2016). "Haiti Doctors Warn of Cholera Crisis After Hurricane Matthew". NBC News. Retrieved October 10, 2016. ^ "After hurricane, Haiti confronts cholera outbreak". ReliefWeb. Agence France-Presse. October 9, 2016. Retrieved October 13, 2016. ^ UNICEF LAC Humanitarian Situation Report on Hurricane Matthew (4 October 2016) (PDF). United Nations Children's Fund (Report). ReliefWeb. October 4, 2016. Retrieved October 9, 2016. ^ Haiti: Teams reach hurricane-affected areas and find needs for clean water and medical care. Médecins Sans Frontières (Report). October 8, 2016. Retrieved October 11, 2016. ^ Haiti: Food, water, and shelter worries in isolated villages. Médecins Sans Frontières (Report). October 20, 2016. Retrieved October 22, 2016. ^ PAHO Responds to Hurricane Matthew Emergency in Caribbean, prepares for cholera upsurge in Haiti. Pan American Health Organization (Report). ReliefWeb. October 6, 2016. Retrieved October 10, 2016. ^ Haïti : l'OMS envoie un million de doses de vaccin anti-choléra. UN Radio (Report). ReliefWeb. October 11, 2016. Retrieved October 15, 2016. ^ "UN launches new fund to support system-wide coordinated response to cholera in Haiti". UN News Center. October 17, 2016. Retrieved October 18, 2016. ^ AMDA Emergency Relief for Hurricane Matthew (Haiti) 06. Association of Medical Doctors of Asia (Report). ReliefWeb. October 20, 2016. Retrieved October 22, 2016.